Your resume is a very basic yet incredibly crucial prerequisite in every job hunt. It should contain all the necessary information like your job experience and capabilities that compels the employer to invite you for an interview. However, it is important to note that every employer or type of profession has its own norms and requirements. Besides, not all employers spend more than two minutes on a single resume. 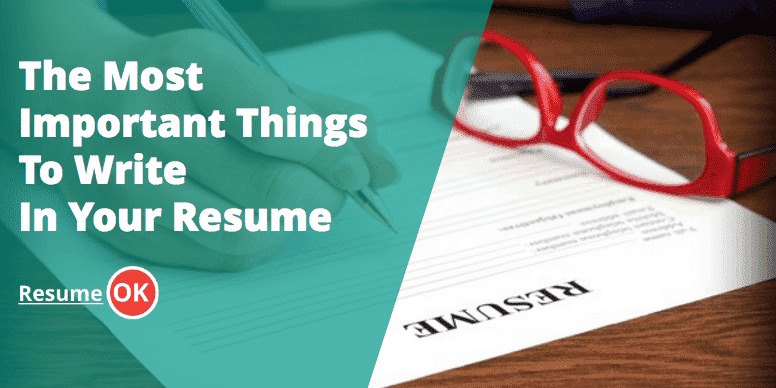 Since your goal is to create one that auspiciously paints a compelling impression of yourself, here is a list of the most important things to write in a resume that works favorably for you and your future employer. Contrary to what a lot of applicants think, not specifying the position you wish to apply for does not automatically grant you the chance at any available position in the company. Being unable to specify what you do gives the impression of uncertainty and indecisiveness. Writing down an objective may also help when you are willing to take any position in a particular department. Employers may or may not prefer seeing an objective that is why it is best to avoid writing generic statements. Be as specific as possible because a majority of those who are tasked to review resumes look for those key words that readily match their search. A common pitfall in unsuccessful job hunting is not being able to put one’s name correctly. Your resume is your story; your name is the most fitting title. Put emphasis on your name by typing it in bold. Using all caps is acceptable, too, but is not as necessary. More importantly, your name and your contact information must be formally placed at the top. Your full address, telephone number, mobile phone number and email address are sufficient as contact information. Just be sure these are correct and updated so that the employer can reach you with utmost convenience. After having intently specified your desired position, be consistent with it through your work experience. An applicant may have had several jobs at a time but purposely including those jobs that have nothing to do with the position applied for may actually reduce your chances of getting hired. If you are looking for a regular, long-term job, putting every part-time job you’ve had would only hurl your resume out of focus. Support your relevant work experience with a short list of responsibilities and accomplishments in bullet form. A lot of applicants declare every school they’ve been to since primary grade. Essentially, high school education and the relevant activities during those years are enough, especially when you’re a fresh graduate with minimum or no experience or trainings at all. Pertinent educational information basically includes the name of your college, the degree you completed and the year you graduated. Other than the items listed above, the general rule is to present a neat, formal and organized resume. Use black ink and a plain typeface on clean sheets of suitably-sized paper. Moreover, keep in mind that the resume’s content must be a truthful reflection of yourself and your capabilities as a prospective employee. Your resume won’t cost you much and it may just be your lucky pass to the job you’ve always dreamed of. very useful info…!!! thank you..!!! I am glad it was useful to you.